This course includes a written and practical skill assessment to validate training competencies. Safety Services Manitoba has also introduced student response technology into the Fall Protection training for a more interactive experience. Safety Services Manitoba’s Fall Protection training provides students with the most current legislative information including industry best practices. This program teaches participants how to exercise the hierarchy of controls including fall prevention, fall restraint, and fall arrest as each situation will be different when working at heights. Students will learn how to inspect fall protection equipment, how to don a harness, and have the opportunity to experience what it feels like to hang in a harness. Participants will receive a certificate upon successful completion of this course. Module 2 – What Are the Major Types of Fall Hazards? Module 3 – Who is Responsible for Each Task? Module 4 – What Do Fall Protection Systems Look Like? 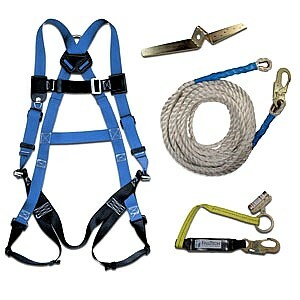 Participants will each inspect components of a fall protection system, i.e., harness, lanyards and hardware. Participants will also have the opportunity to briefly be suspended in a harness. Persons working at a vertical height of 10 feet or more (Manitoba) or 8 feet or more (Federally) must implement fall protection programs in their workplace. * This course is also offered online.